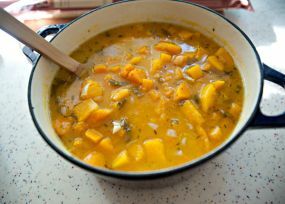 Squash Soup is a Bolivian food recipe with hot chilies, onions and carrots. In a large, non-aluminum saucepan, warm the butter over medium heat. Stir in the onions, carrots, and garlic. Cook for 3 minutes and then cover the pan. Lower heat and cook for 3 or 4 more minutes, until the vegetables are very tender. Stir in the tomato puree, chilies, butternut squash, and chicken broth. Bring the soup to a simmer and cook for 30 minutes. Mash the squash pieces with a potato masher, season to taste and serve. Serve with lime wedges and corn bread.